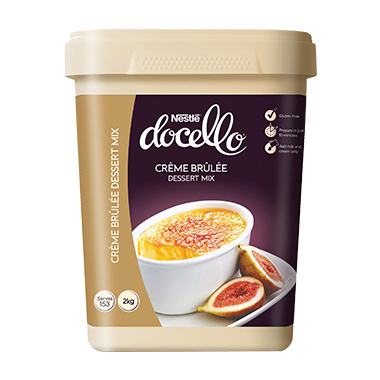 NESTLÉ Docello Crème Brulee Dessert Mix is a free flowing powder made with an authentic French recipe to restaurant quality and can be prepared in just 10 minutes. This dessert mix can be used as a base to make signature desserts – personalise them by incorporating summer fruits, stone fruits and berries. 1. Mix necessary amount of milk and cream in pan. Bring to boil. 2. Remove from heat. Whisk in required Créme Brûlée mix until fully combined (approx 1 minute). 4. Chill until set. Before serving sprinkle with brown sugar to cover. Caramelise sugar with blowtorch or under grill. Note: 2.0kg Crème Brulee mix, 7.7L cream & 7.7L milk serves 153. Ingredients: Sugar, Dextrose (From Maize), Corn Starch (Sulphites), Whole Egg Powder, Stabilisers(407, 407a), Flavours, Colours (160a, Beetroot Juice Powder), Salt. Contains Sulphites and Egg.Manufactured on equipment that also processes products containing Milk and Soy.